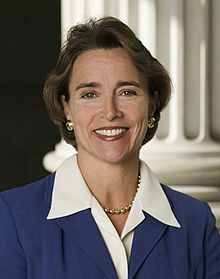 Blanche Meyers Lambert Lincoln (born September 30, 1960) is an American politician and lawyer who served as a U.S. Senator from Arkansas from 1999 to 2011. A member of the Democratic Party, Lincoln was first elected to the Senate in 1998; she was the first woman elected to the Senate from Arkansas since Hattie Caraway in 1932 and, at age 38, was the youngest woman ever elected to the Senate. She previously served in the U.S. House of Representatives, representing Arkansas's 1st congressional district from 1993 to 1997. Lincoln was the first woman and the first Arkansan to serve as chair of the U.S. Senate Committee on Agriculture, Nutrition and Forestry. She also served as the Chair of Rural Outreach for the Senate Democratic Caucus. In 2010, she ran for a third term, but was defeated by Republican John Boozman, whose brother, Fay Boozman, she defeated in 1998. Today, she is the Founder and a Principal of Lincoln Policy Group, a consulting firm that assist its clients in successfully navigating the legislative and regulatory bureaucracies of the federal government. A seventh-generation Arkansan, Blanche Lambert was born in Helena, Phillips County, the daughter of Martha (née Kelly) and Jordan Bennett Lambert. Her father was a rice and cotton farmer. Her older sister, Mary Lambert, is a film director. She received her early education at the local public schools in Helena, and was the student council president at Central High School from 1977 to 1978. Lincoln attended the University of Arkansas in Fayetteville, where she was a member of the Chi Omega sorority. She graduated from Randolph-Macon Woman's College (now known as Randolph College) in Lynchburg, Virginia, in 1982, earning a Bachelor's degree in biology. She originally sought to go into nursing. After graduating from college, Lincoln served as a staff assistant for U.S. Representative Bill Alexander, a Democrat from Arkansas's 1st congressional district. She remained in Alexander's office until 1984. In 1992, Lincoln defeated Alexander in the Democratic primary, by a margin of 61 to 39 percent. She subsequently won the general election, beating Republican Terry Hayes with 70% of the vote. Her election to the House coincided with the election of fellow Arkansan Bill Clinton as President of the United States. She called herself a centrist Democrat and was among the minority of Democrats to support CAFTA. While in the House, she was one of only 17 Democrats to vote for the Teamwork for Employees and Managers Act of 1995 which sought to change federal employment laws. The law was vetoed by President Bill Clinton. She has voted in favor restricting class action lawsuits and tightening rules on personal bankruptcy. Lincoln was also one of the few Democrats in Congress to vote in favor of Bush administration's tax cuts and she supports the permanent elimination of the estate tax. On April 5, 1995 she was one of only 27 Democrats in the House to vote in favor of the Contract With America Tax Relief Act, which was approved by the House. Lincoln also co-sponsored and supported legislation to amend the constitution to require a balanced-budget amendment. In 1996 she championed the Freedom to Farm Act. She was reelected to a second term under her married name, Blanche Lincoln, and served in the House of Representatives until 1997. Lincoln chose not to run for reelection in 1996; she was pregnant at that time. In 1998, Lincoln returned to politics and ran for the Senate seat being vacated by incumbent Senator Dale Bumpers. She defeated her Republican opponent, Fay Boozman (1946–2005), a state senator and the brother of future U.S. Representative John Boozman, 385,878 (55.1 percent) to 295,870 (42.2 percent). Lincoln concentrated primarily on issues involving farmers and rural issues. She was one of the primary advocates of the Delta Regional Authority, which is designed to spur development in the lower Mississippi Delta region. Lincoln became Arkansas's Senior Senator in January 2003, serving with Democrat Mark Pryor, who defeated incumbent Senator Tim Hutchinson in November 2002. In 2004, Lincoln was re-elected, defeating Republican state Senator Jim Holt (R-Springdale) by 56%-to-44%, even as President Bush carried the state with 54% of the vote. She  received more than half a million votes, the highest total cast for any senatorial candidate in state history. Lincoln holds a press conference in 2006 with Sen. Max Baucus (D-MT), chairman of the Senate Finance Committee regarding proposed changes to Medicare. In March 2007, Lincoln called for the resignation of Attorney General Alberto Gonzales, claiming that the firing of eight federal prosecutors created a "serious breach between the Justice Department and Congress, a breach that I'm not sure can be repaired with Mr. Gonzales at the helm." She and Senator Pryor were particularly upset that Gonzales reneged on a promise to have a replacement for Bud Cummins, U.S. Attorney for the Eastern District of Arkansas, go through a Senate confirmation. 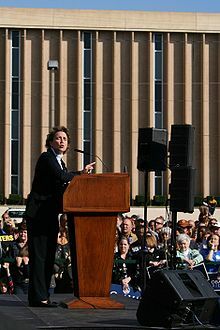 Gonzales resigned in August 2007. In 2007, Lincoln played a key role in brokering the compromise that led to passage of the Food, Conservation, and Energy Act of 2008. Also known as the “farm bill,” this legislation provides resources for nutrition, conservation, rural development, and renewable energy. Lincoln led the charge against defeating an amendment to the pending Farm Bill which would have capped government Agricultural subsidy payments at $250,000 per year, per farm. According to Lincoln, it was unfair to some farmers in her state, notably cotton growers. Even though the amendment passed (56–43), Lincoln threatened a filibuster if any amendment did not get a 60-vote majority, so the amendment was withdrawn after passage. Senator Lincoln speaking in Jonesboro, Arkansas, on October 25, 2008. Lincoln was in the 2007 documentary 14 Women, directed by her older sister, Mary Lambert. In September 2009, Lincoln pledged to filibuster any legislation containing a Public health insurance option, such as the Affordable Health Care for America Act (the Democratic-controlled, House of Representatives' preferred health care reform bill). This move came as a surprise to liberal Democrats, who largely interpreted the move as a betrayal of traditional Democratic values. Lincoln voted in favor of the Patient Protection and Affordable Care Act, the Senate bill that eventually became the Barack Obama administration's health care reform law. However, she voted against the Health Care and Education Reconciliation Act of 2010, a package of amendments to the Affordable Care Act—passed via reconciliation process, to circumvent united Republican attempts to block the bill's passage—in the Senate. Lincoln speaks during the second day of the 2008 Democratic National Convention in Denver, Colorado. Lincoln's votes on health care appeared to be positioning her as a high-profile, "conservative Democrat", to avoid being perceived as a "liberal" by an Arkansas voting public that had turned increasingly Republican. In 2009 she spoke out in opposition to the pro-labor union bill known as the Employee Free Choice Act; this garnering her the praise of conservative interest groups like Americans for Tax Reform, but also bitter criticisms from labor unions, who publicly threatened to discourage Arkansas' remaining Democratic-leaning voters from voting for her. In November 2009, Lincoln voted against bringing Guantanamo Bay prisoners to the United States for trial. On December 9, 2010, Lincoln missed, by three minutes, a critical vote to repeal Don't ask, don't tell after a dental appointment. A supporter of the bill, Sen. Joe Lieberman (I-CT), told reporters: "She was very frustrated and apologized to both of us." She said she would have voted for repeal had she made the vote. 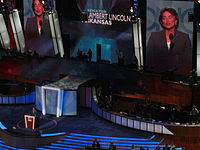 With the Obama Administration having become hugely unpopular in her home state, Lincoln's re-election strategy in 2010 was to depict herself to Arkansas voters as 'independent' of the Democrats. After first narrowly surviving a primary challenge by the state's then-Lieutenant Governor Bill Halter, Lincoln lost in November 2010 to Republican Congressman John Boozman by a landslide, 58%-to-37%. 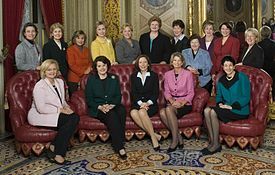 In 2004, Lincoln co-founded the Senate Hunger Caucus. The caucus was established to provide a bi-partisan forum for Senators and staff to discuss, advance and engage the Senate's work on national and international hunger and food insecurity issues. Lincoln served on the Senate Finance Committee; Special Committee on Aging; Senate Committee on Energy and Natural Resources; Senate Social Security Task Force; Rural Health Caucus; Senate New Democrat Coalition and chair of the Rural Outreach for the Senate Democratic Caucus. 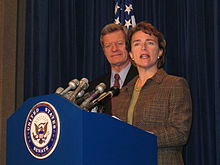 On September 9, 2009, she became Chairman of the Senate Agriculture, Nutrition, and Forestry Committee. In the Committee’s 184-year history, she was the first Arkansan and the first woman to serve as Chairman. Lincoln remained in Washington after her re-election loss in November 2010, working as Special Policy Advisor at the firm of Alston & Bird. In 2011 Lincoln became chair of Small Business for Sensible Regulations, a project of the National Federation of Independent Business. ^ a b "Biography". U.S. Senator Blance Lincoln. Archived from the original on December 2, 2009. ^ "Leadership | Senate Democrats". Democrats.senate.gov. January 18, 2013. Retrieved May 5, 2013. ^ a b c d e "Blanche Meyers Lambert Lincoln (1960–)". The Encyclopedia of Arkansas History & Culture. ^ "Arkansas Congressional Directory". Govnotes.com. Archived from the original on June 28, 2010. Retrieved June 7, 2010. ^ "About". Blanche Lincoln for Senate. Archived from the original on May 24, 2009. ^ "Mary Lambert". The Internet Movie Database. ^ a b "LINCOLN, Blanche Lambert, (1960 - )". Biographical Dictionary of the United States Congress. ^ Barton, Paul (June 18, 2009). "From Congress to Costco". Arkansas Times. ^ Hendricks, Nancy. "Blanche Meyers Lambert Lincoln (1960-)". Encyclopedia of Arkansas. Retrieved June 3, 2015. ^ Max Brantley (March 15, 2007). "Arkansas Blog: C-SPAN alert". Arkansas Times. Retrieved December 6, 2014. ^ Brian Beutler (November 21, 2009). "Lincoln: "I'll Filibuster A Public Option Bill" | TPMDC". Tpmdc.talkingpointsmemo.com. Retrieved June 7, 2010. ^ Prandoni, Chris (October 19, 2009). "Senator Blanche Lincoln (D-Ark.) Reiterates Opposition to Employee Free Choice Act". Workerfreedom.org. Archived from the original on October 22, 2009. Retrieved June 7, 2010. ^ "Lincoln, Pryor back bid to block funding to hold terror suspects in U.S. | Arkansas News". Arkansasnews.com. Archived from the original on July 18, 2011. Retrieved June 7, 2010. ^ Brian Beutler (December 9, 2010). "Root Canal'd! Lincoln Misses DADT Vote In Dentist Chair | TPMDC". Tpmdc.talkingpointsmemo.com. Retrieved May 5, 2013. ^ a b "Arkansas Secretary of State". Votenaturally.org. Retrieved May 5, 2013. ^ Faler, Brian (November 25, 2004). "Senators Form Hunger Caucus to Draw Attention to Issue". The Washington Post. Retrieved April 26, 2010. ^ "About Us". Third Way. Archived from the original on May 30, 2010. Retrieved June 7, 2010. ^ "Blanche L. Lincoln - Legislative and Public Policy Lawyer - Alston & Bird LLP". Alston.com. Archived from the original on February 17, 2013. Retrieved May 5, 2013. ^ "Small Businesses for Sensible Regulations". Sensibleregulations.org. Retrieved May 5, 2013. ^ "92 PRESIDENTIAL and CONGRESSIONAL ELECTION STATISTICS". Clerk.house.gov. Retrieved May 5, 2013. ^ "94 CONGRESSIONAL ELECTION STATISTICS". Clerk.house.gov. Retrieved May 5, 2013. ^ "1998 Election Statistics - Legislative Activities - Office of the Clerk". Clerk.house.gov. Retrieved May 5, 2013. ^ "2004 ELECTION STATISTICS". Clerk.house.gov. Retrieved May 5, 2013. ^ "Arkansas Secretary of State". Votenaturally.org. Retrieved May 5, 2013.